The Home of the Corvette is also a vibrant university town with a lively downtown business center and walkable shopping and entertainment district. Several outer-lying suburban areas create a commuter-based county that is very scenic with hillsides and rolling farmland. Bowling Green boasts family-fun entertainment and world-class attractions and serves as the region’s shopping and dining hub. Also known as “Corvette City USA” and the capital of Kentucky’s Cave Country, Bowling Green is a friendly community, dedicated to southern hospitality, that is casual yet progressive. South Central Kentucky offers a wide variety of recreational opportunities from world-class museums like the National Corvette Museum, the Historic RailPark & Train Museum and the Kentucky Museum to heritage attractions like Aviation Heritage Park, the Civil War Discovery Trail and Corsair Distillery. For natural wonders, the city is home to Kentucky's only underground boat tour at Lost River Cave, also the site of a 66-acre valley with trails, a wetland, nature center and nature explore classroom. Just 30 minutes away lies Mammoth Cave National Park and several other caves open for tours. Barren River State Park in neighboring Barren County offers boating, fishing and water recreation opportunities. Canoe and kayak enthusiasts enjoy multiple navigable waterways in the Bowling Green area as well as fishing opportunities at Basil Griffin and Shanty Hollow lakes (another great hiking destination). Several miles of paved Greenways trails around the county offer safe walking, biking and jogging. There are several public and private golf courses to enjoy as well as more disc golf courses than many major cities. Hunting is very popular in the area, with a shooting center nearby. As the shopping and dining mecca for 10 surrounding counties, the region has a wide variety of options including boutique shops, a shopping mall with major department stores, most major chain stores and restaurants, two movie theaters and many locally-owned eateries. Several annual festivals and a 3-month long weekly outdoor concert series each summer fill the town with community-friendly events. Professional minor-league baseball team the Bowling Green Hot Rods play nearly 70 home games here each season plus year-round college sporting events are found at Western Kentucky University. A variety of Community Education classes are available in addition to multiple free courses at library branches. Western Kentucky University also offers a Lifelong Learning Program to all ages in a variety of interest areas. The Southern Kentucky Performing Arts Center, home of Orchestra Kentucky, also hosts national and regional tour productions as well as rotating exhibits in two art galleries. 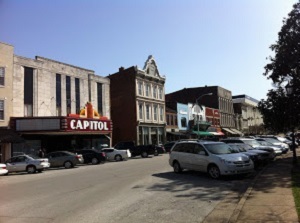 The smaller, historic Capitol Arts Theatre hosts local and regional acts while The Phoenix Theatre offers productions from local troupes Public Theatre of Kentucky and Fountain Square Players. Art enthusiasts are impressed by the Downing Museum at the Baker Arboretum and enjoy dozens of galleries around town plus the Bowling Green Gallery Hops occurring about six times each year. WKU Theatre and Dance, Music, and Art departments fill the academic calendar year with cultural opportunities in addition to The Symphony at WKU and a variety of lectures. Bowling Green has a rich musical heritage and boasts numerous live music venues creating a vibrant nightlife. A free summer concert series takes place at two neighboring public parks in addition to several music festivals each year. The Warren County Public Library consists of four branches and features guest speakers, visiting authors, lectures and much more. Go bg Transit is a small fee-based public transport system in and around the city. Several rental car companies, taxi services and UBER are available, with a Greyhound bus station near downtown. Bowling Green is only an hour from Nashville International Airport with a smaller, regional airport in town. Two major hospitals are in the Bowling Green city limits, TriStar Greenview Regional Hospital and The Medical Center. Greenview has a Healthy Aging Program for patients over 50 and provides cancer, cardiac and critical care plus orthopaedic and neurosciences services. The Medical Center has a Senior Health Network for patients over 55 and features the Heart Institute, a comprehensive cardiac program, Primary Stroke Center, Cancer Treatment Center, orthopaedic and neuroscience services. The Medical Center's parent company, Commonwealth Health Corporation, also operates the Commonwealth Health Free Clinic. Additionally, a VA Community Based Outpatient Clinic is available as part of the Tennessee Valley Healthcare System providing services for veterans in Kentucky and Tennessee. Multiple nursing and assisted living facilities are located throughout the city. Jan 25.4 F° 34.2 F° 43.0 F° 4.2 "
Feb 28.6 F° 38.6 F° 48.6 F° 4.2 "
Mar 36.9 F° 47.8 F° 58.6 F° 5.0 "
Apr 45.0 F° 56.8 F° 68.6 F° 4.0 "
May 54.5 F° 65.8 F° 77.0 F° 5.4 "
Jun 63.4 F° 74.3 F° 85.3 F° 4.3 "
Jul 67.7 F° 78.5 F° 89.2 F° 4.5 "
Aug 65.7 F° 76.8 F° 87.8 F° 3.4 "
Sep 58.1 F° 69.6 F° 81.1 F° 4.1 "
Oct 45.7 F° 57.9 F° 70.1 F° 3.2 "
Nov 37.2 F° 47.4 F° 57.6 F° 4.5 "
Dec 29.2 F° 38.3 F° 47.4 F° 5.1 "
Bowling Green and the South Central Kentucky area typically have 265 blue sky days per year with four distinct seasons. Temperatures are generally warm beginning in late April to September with hot and humid summers. Cold season is from November to February with only a few snow events typically with little or no accumulation. Biggest weather risks include flash floods, tornadoes and ice. Condos Over 50 Communities Housing options of all shapes and sizes can be found in Bowling Green. The region consists of independent living retirement centers, condos, apartments, suburban neighborhoods, downtown lofts and a huge amount of land in the county available for building. The Housing Authority of Bowling Green provides housing at four locations throughout the and provides numerous programs to assist low-income individuals and families throughout Bowling Green/Warren County in becoming self-sufficient and moving from rental to home ownership. The Southern Kentucky Performing Arts Center, Riverview Historic House museum, Historic RailPark & Train Museum and Lost River Cave welcome volunteers for various events and peak visitor times. Community organizations including, but not limited to, Junior Achievement, United Way, Center for Courageous Kids, Bowling Green Warren County Humane Society, The Medical Center, The Salvation Army, Boys & Girls Club of Bowling Green and Hope House Ministries provide a variety of volunteer options.